The sport that launched the careers of legendary soccer greats is now available to Miami’s young athletes. FC Futsal’s regular program takes place on Wednesdays and Fridays beginning at 4:30 p.m. at 5800 SW 81 Terrace in South Miami. Futsal is a modified form of soccer played with five players per side on a smaller field. With serial entrepreneur Mark Cuban as an investor, there’s no doubt futsal is about to become the next big thing on America’s sporting field. Long popular in Europe and South America where its youth groups have spawned some of the world’s best soccer players — Pele, Ronaldo, Neymar and Messi to name a few — Futsal is about to kick off in a big way in the United States when the Professional Futsal League launches in 2017 with Cuban among the investors and promoters. Miami-based FC Futsal, a newly formed youth futsal organization, is giving U.S. kids an opportunity to follow in the footsteps of world-renowned soccer greats who trace their professional success to their beginnings in futsal. Michele Walters and her business partner, Estela Nickerson, are among the first enthusiasts to make an organized effort to expand youth futsal to the United States. Skill Development: Futsal gives each player 1200 percent more ball contact than soccer and, because it’s played on a smaller field, players quickly learn proper close control and pinpoint passing techniques. Speed of Play: The game develops quick reflexes, so players learn to think fast and make tactical decisions. Continuity of Play: Continuous action keeps players engaged and enhances physical conditioning. Position Experience: With four field players and a goalie, players learn to be versatile as they transition continuously between offensive and defensive plays. FC Futsal operates under the direction of Head Coach Guga Alencar who was most recently assistant coach and conditioning coach for the Fort Lauderdale Strikers, a professional soccer team. A native of Brazil, Alencar, who grew up playing futsal before becoming a professional soccer player at age 17, credits the game for his success as a professional player and his subsequent enrollment in Florida Atlantic University. In addition to coaching FC Futsal’s regular program, Alencar also heads up an outreach program for underserved communities in the Miami area. “The kids [in the community program] didn’t have much soccer experience, but they know how to move; they’re athletic,” said Alencar who often shares his own story to demonstrate to the players how futsal can be a springboard to a bright future. FC Futsal’s regular program takes place on Wednesdays and Fridays beginning at 4:30 p.m. at 5800 SW 81 Terrace in South Miami. The free community outreach programs takes place on Thursdays from 6:30-8:30 p.m. at the Gibson-Bethel Community Center. 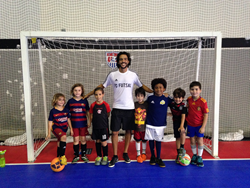 About FC Futsal: Established by Miami residents and business owners Michele Walters and Estela Nickerson, FC Futsal is open to kids between the ages of 4 and 14. FC Futsal currently offers skills training to more than 80 kids in three Miami locations, including a weekly no-fee session at the Gibson-Bethel Community Center in South Miami. For more information or to find out how to arrange a free introductory lesson, visit http://www.fcfutsal.com.